And it is not just aspiring Olympians who are attracted to the keen competition and 45-boat fleets. On many days, two generations of the same family compete on the same course. John Kirkpatrick is a high-school student at St. George’s School who races Radials in the summer and full rigs in the winter. A sparring partner of Christine Neville’s, John finished second in the Laser Radial Atlantic Coast Championship last summer. John often rigs up next to his Dad, Steve Kirkpatrick, a Master sailor who has won the day three weeks in a row. A graduate of the Wharton Business School, Steve finds Laser frostbiting in Newport to be “the best value in sailing.” Storage and dues are just $140 per season. Kirkpatrick was also quick to point out that gently used boats can be found for around $2,500. Just don’t tell that to Dwight Escalera. A marine surveyor for Executive Marine Services in Wakefield, Dwight bought a Laser he found on craigslist for – and this is not a typo – $650. The powder blue yacht, named Improv, had been stored in a basement for 35 years. His sail number, 13222, is the actual hull number, which is remarkable considering that more than 200,000 Lasers have been built. Another father/son campaign is made up of Larry and Parker Colantuono. Larry is the General Manager and Vice President of Brewer Wickford Cove Marina. Parker is a freshman at Portsmouth High School whose height makes him look more like a freshman in college. Parker enjoys sailing against his dad, but even if he has a great day on the racecourse there is no trash talking in the truck on the way home. Ah, well, fans can be fickle and one can only hope that Ferg, who designed the masts for the America’s Cup winner ORACLE, won the Laser Masters Worlds twice, and was inducted into the St. George’s School Hall of Fame, isn’t taking the slight personally. Ed Adams, the 1987 and ‘91 Rolex Yachtsman of the Year and former Star World Champion, is no stranger to the front of Fleet 413. After racing, he is often greeted on shore by his happy Labrador retriever Bodie who is, according to Adams, “all brawn, no brains.” Adams is quick to share his top tips and insights with competitors after sailing. Mark Bear, a professor at MIT, is one of the many who has benefited from being a student of Ed’s. In 2002, Bear finished second at the Master Worlds following numerous coaching sessions with Ed, who won the Worlds that year. Of all the sailing Professor Bear does, frostbiting Lasers in Newport is his favorite. Despite the presence of numerous former World Champions, Olympians and collegiate All-Americans, all of the regulars cite the fleet captains as the reason the organization has stayed strong over the years. This winter, Peter Shope and Jack McVicker share the privilege and responsibility of running the fleet. Shope is focused on making the racing as competitive as possible. He was the Fleet Champion last season, won the Masters Nationals this summer and finished third at the Masters Worlds. His goal is to create a guide for running races so the quality is always high and people know exactly what to do, as each weekend a different fleet member is responsible for doing RC. Jack McVicker, a real estate agent with Re/Max, has deep ties to the Newport community and is keen to get as many boats out on the water as possible. He also keeps score for the season, which can be a daunting task. 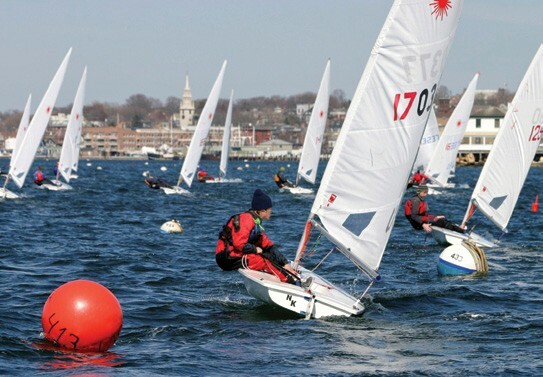 Last season, more than 77 sailors participated in approximately 150 races. McVicker’s duty was made easier when local computer whiz and Laser 2 Champion Avram Dorfman wrote a program that simplifies the scoring process. The entire fleet is grateful for the race committee leadership of Moose McClintock, who runs more races than anyone else. A veteran of two America’s Cups as well as a world-class sailor, Moose runs perfect races. Wearing his headphones and sunglasses, he constantly squares up the course to make sure the racing is proper. And when Moose is calling the shots, there is no grousing; respect is shown. If there is a secret ingredient to the fleet’s success, it may well be the gathering at the International Yachting and Athletic Club after racing. Located on Thames Street, IYAC was voted Wight Vodka’s Favourite Yachting Bar in 2011 by the readers of boats.com. 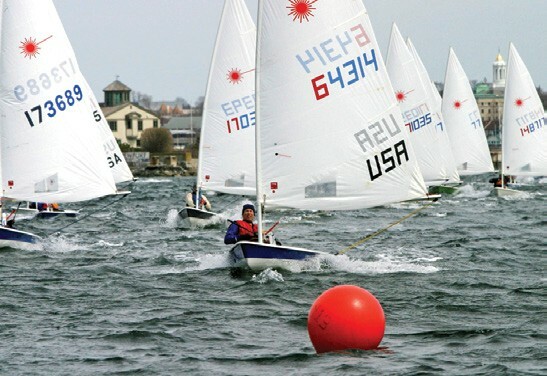 As the changing facilities at Sail Newport are the backseats of the sailors’ cars, the welcome at IYAC feels that much warmer, the food tastes better, and the adult beverages wash away any regret from the day’s performance. With the sincerity of a competitor begging for room at the leeward mark, Ed Adam’s Labrador retriever Bodie looks deeply into your eyes in the hopes you might share a bite of crust. For at IYAC, salty sailors and salty dogs are all treated like family. At the Laser Master Worlds in Hyeres, France in October, there was some heated debate as to the location of the world’s best Laser fleet. Those from Newport’s Fleet 413 displayed their pride. At the same time, members of the Royal Canoe Club in Sweden stated they may well have the premiere organization. 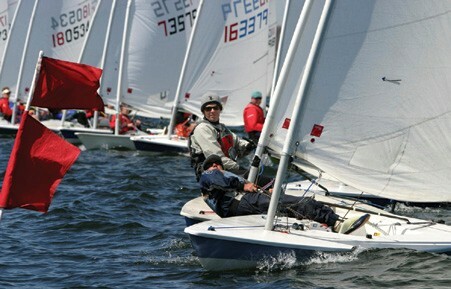 To join the Newport Laser fleet, visit newportlaserfleet.org. Joe Berkeley is a member of Laser Fleet 413 and a freelance Creative Director. His work is at joeberkeley.com. Brokers Tips: What Are You Considering Buying?